Cricket Australia is one of the most innovative players on the global digital sports media playing field. Collectively, it has over 28 million fans across its network of social media accounts, making it one of the world's most popular digital sports organisations. 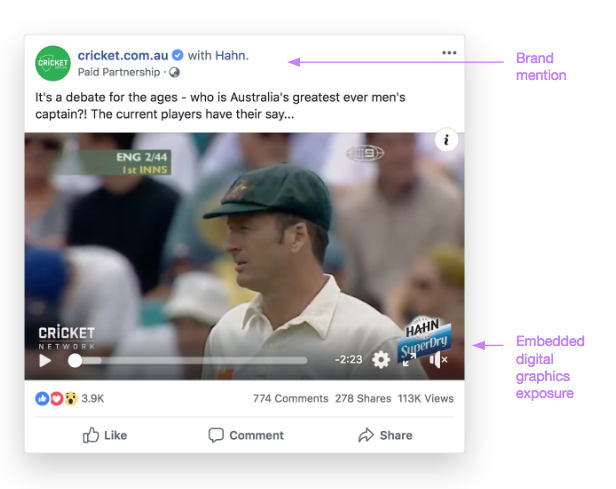 Alongside its expansive digital footprint, Cricket Australia (CA) has emerged as an industry pioneer in creating commercial opportunities for brands to connect with fans and consumers through its integrated digital content and product programs. It not only has dedicated team of content producers that travel with the Australian Men's and Women's cricket teams, but also has a dedicated Digital Commercial team, whose role is to ideate, create, and execute branded content integrations across digital platforms. The CA team has been using the Klip Desk Analytics online dashboard to measure content engagement, and can now provide sponsors with campaign performance updates and specific reports based on Australian only impact on a regular basis. Klip Desk is an AI-driven sports highlights editing, publishing, and measurement platform. Klip Desk helps rights holders and brands thrive in the digital media landscape, through automated editing and publishing of highlights content to social media accounts, websites, and apps. We use machine learning to measure content and brand performance across digital channels, tracking the value of brand integrations, as well as traditional assets such as a clothing and apparel. Klip Desk was founded in 2015 and was acquired by the Dentsu Aegis Network in 2017.